I saw this video a few weeks back and as I scrolled through my You Tube favorites again today it caught my eye again and had to watch and listen to the lyrics again. Take the time to check it out now.....it's not long. I love the song by Kevin Honeycutt and the video that was created to go along with it. It shapes an important message of how we need to change school and not only does it resonate with me, but I also think we need to start making those changes. However, I often become concerned with the criticism that teachers, administrators and schools in general seem to take for not making all these changes immediately. Don't get me wrong, these changes need to take place, and the sooner the better. But the public school system is a massive institution and it has far too many leaders, officials, and businesses pulling at the puppet strings. There should be no wonder at why change can move slow in public schools. Granted some changes come a little too quickly like those forced down by state governments. The Common Core Standards, Teacher Evaluation Systems, School Report Cards, Teacher Report Cards, New Standardized Testing programs and more are all initiatives with good intent but the pace of the changes has done nothing to improve things, but it has greatly increased stress for teachers. So what is the reaction in a situation like this? Do staff quickly move to a completely new way of teaching? Do they increase student voice and choice? Do administrators quickly move to a life skills/job skills curriculum and instructional practices to match? Or do they stay with what is safe? Do they tend to stick with practices they are comfortable with while they learn the new standards or the new technology? Do they play it safe when their administrators talk about school report cards and accountability? We all need to excuse ourselves a little as we prepare for the changes that need to take place, and accept that not everyone changes at the same pace. We need to be a united front as we attempt to create a better system for students, better instructional practices, and let them have some control of their learning, but we also need to make sure that the puppet masters hear this message too. We need to bring them on board and to stop letting them steer this ship from a distance. What are your thoughts on the reform efforts being made? Do you feel the pressure to change, but are confused about how to move forward? Great post as always! I keep having to remind myself that change takes time. There are so many things I want to see changed in the schools I work with. Don't get me wrong, they're doing a great job and I am very proud of the progress we have made. I just see the potential for so much more. It's hard to determine how much to stretch people. A friend of mine likened it to as shooting a rubber band. If you don't stretch it, it'll go nowhere. If you stretch it too far, it'll break. The key is to stretch it the right amount and then letting go of where it was so it will fling forward. I'll second what Brett has said. While there can be no doubt of the imperative to change, and that virtually all of us are moving too slowly to keep up with what our students need; it's also true that there are a great many drags on that change. Budgets, for one, are not always there to accommodate technological and other changes (even for something as simple as more flexible, comfortable furniture to support collaboration). Staff inertia is another, and that's not always pejorative. It can be overwhelming for staff to have to change so much, so quickly, and still maintain a life-work balance. And of course, leadership (state/provincial, division/district, and in-school) doesn't always recognize or value the changes necessary. I'm hopeful, though. I do sense a growing recognition that the status quo is simply unacceptable. That's the first step, and now we're into a significant amount of experimentation to establish new practices that work. Nice video, by the way. May show this at a future staff meeting. Thanks Tom. I think you're spot on. Change is slow and difficult and nuanced. Those who speak loudest about it are often people who have little experience in the complexities of it. Those who know best (leaders from within) need to take charge and slowly steer the ship back in the right direction. Great post Tom. The problem is not change as you elude to. Instead it is the type of changes that have been initiated without the input from those in the trenches. It would be like one of use mandating/directing Mario Vitale how to cook or Tom Hanks how to act. Change can and will always be good for education. We must consistently reflect on how we can improve in response to societal and demographic shifts. One thing is for certain though. When initiating any change with the hopes of sustaining it we must focus squarely on one initiative at a time in order to get it right. This is why, in my opinion, all of the recent reform efforts will fall. It is a throw everything against the wall and see what will stick approach. Very good points but take a look at it from the student's perspective. Slowly moving towards some alternative that is not the status quo doesn't do them much good does it? We are in the process of losing an entire generation of Americans to the end result of obsolete beliefs about the role of education in this nation. That generation will eventually be charged with participating in solving some of the most daunting problems this nation has ever faced. What I think we need to understand is that America doesn't have a educational crisis, America has a leadership crisis. In order for sustainable, effective change to take place, the gap between our current state and our desired state must be identified clearly. Legislation does little more than saying that our current state is not good enough and that the desired state is that more students do well on standardized assessments. How do legislators propose we achieve our desired state? National standards, national testing, school report cards, and teacher evaluation systems based on student growth on standardized assessments. Change at the school and district level cannot be effective if local stakeholders are unsure of what they're trying to achieve and how they reasonably think they can get there. Any educator would tell you that higher tests scores are possible, but they may come at a cost of what we truly value for current students preparing for future society. And even if we get higher scores, it will never be good enough for these external measures because all students have different talents and abilities that are demonstrated in ways that can never be captured by standardized assessments. If the measure is wrong, it certainly should not become our target. The real concern for me is that as this all plays out and we start, stop, and sputter through initiatives, the world moves further toward making the traditional model of education obsolete for our society. These legislated initiatives and accountability measures are distracting us at a time when our kids can least afford it. The cumulative effects of the mandated changes have soured us. These changes aren’t real in that they don’t view them as setting our teachers, schools, or students up for success. Furthermore these mandates have zapped us of resources, time and energy that should be better spent implementing real change. Real change is complex, and real change needs to happen now. I don’t buy into the argument that significant change takes five years. Too many organizations, corporations, and teams are able to make significant, cultural-shifting changes far more quickly. Our students don’t have five years to wait. Thanks for this post, Tom. You're right: all of these mandates make it very difficult and frustrating for educators. 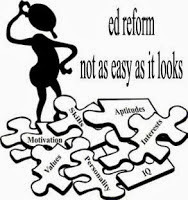 Although a deep culture-shift in education is needed, most often attempts at reform come from extrinsic sources that are not educationally sound or research-based, which brings about (well-deserved) reluctance when it comes to buy-in. Standardized testing keeps growing in importance, but it's not something that will help our kids in the long run. Additionally, so many of these external reforms have come and gone, causing people to wonder which ones are here for the long haul and which will be short-lived. There are mandates (from our lawmakers) with no money (from our lawmakers) - again. The culture of education is deeply imbedded into the American way of life, and politics is such a strong force driving it. Although companies may reform when the need arises, public education is a far more complicated social system, affecting every person in the nation, not simply employees and stockholders. Having worked in the private sector for many years, I have witnessed and been part of companies that effect change in a relatively short period of time. Education is a completely different animal with far more intricacies and nuances than even the most complicated business plan. Anyone involved in a school system on a daily basis these days knows how much shifting is going on and understands the difficulty in navigating these changes. It has been so affirming to have volunteers who come in to our school and then offer words of encouragement in our building. They see the dedication of educators and they also see the challenges. I have been asked several times by these volunteers this year why I keep doing this. We are committed to helping our kids grow to be successful and contributing adults. Most of us are deeply passionate about the kids we serve. We KNOW kids are growing up in a different world than we did. We don't need to be told that! The kids in our classrooms are very different from the kids in my classrooms when I was growing up. We are doing the very best we can with the limited resources we have. We're going above and beyond to make a difference in our kids for their futures. Thanks for your questions! Wish someone who could make a policy change at a very high level would ask these of the right people! I work in a division that has invested 12 years in work to shift practice that supports acquisition of lifelong learning competencies. We fight uphill all the time against bureaucratic forces from the state and fed government mandates - a long-armed reach into every classroom in the United States. I find that teachers live in a world where they constantly are caught between making sense of how to support learners using professional knowledge and judgment while following "the rules." Teaching as a subversive activity is the real world of efficacy today. Superficial change takes time, deep change takes a long time. Providing space for educators to work in personal and collaborative ways as they hone skills and develop expertise is hard to do. Recognizing that is key for educators to venture into the risk-taking essential to learning. However, if we don't make that okay, I don't know how we can expect teachers to do the same with the young people they serve. Thanks for making sense of this, Tom- really helpful to us all. Most of the writing and research on change management in organisations indicates that effective change means change in culture and change in culture takes time. This year, for example, we worked to adapt guided reading instruction to better meet the needs of our English Language Learners. We had whole-day professional development (school-wide) on the first day (pupil-free) in Term 2. Over term 2, teachers were asked to practice the new skills, including a co-teaching opportunity and 'lab' environment with the original presenter. In term 3, a literacy coach and peer coaches gave teachers feedback on the use of their new skills. In term 4, I did classroom walk-throughs for informal evaluation of their new skills. The thing about change is that you need to give teachers adequate time to plan, practice, receive feedback, and improve before we can expect the skills to become part of classroom culture. Our change to a culture of unit planning (UbD with common, rich assessment tasks) will take 3-5 years to fully implement. Teachers cannot build excellent units the first year, nor can they evaluate and enhance curriculum units for the entire Australian curriculum in less time than that. Change is difficult but necessary. The hard part is knowing what to change and not just changing for the sake of changing. Each district, school, and classroom is in a different situation. To me, this means that knowing what to change is even a difficult proposition. What I do know is that as a principal, if I see a change that needs to be made, I must address it with the teacher. If a teacher says they want to make a change or take a risk, as a principal I need to support the change. In either of these scenarios, honest feedback and reflection is required. Trusting relationships will allow for changes to be discussed, decided upon, and implemented.